My tour of the Doll Room is coming to an end with this final installment of thirteen photos. I hope you have enjoyed your tour of Land of Oz Dolls. Some day, I hope many of you can stop by for a visit. If you are traveling through the area and would like to stop by to see us, as of September 2014, we opened Roberts’ Roost Country Guest House. We would love to have you stay with us a few days! We have just been featured on Carroll County Illinois Tourism’s website. Here is a link to the article: http://visitcarrollcountyil.com/roberts-roost-country-guest-house/ . Until next time, have a great Dolly Day! “Tour of the Doll Room” Continues On! Tour of the Doll Room at Land of Oz Dolls Continues! Land of Oz Dolls is very proud to announce the opening of Roberts’ Roost Country Guest House in Savanna, Illinois. After always wanting a quiet retreat setting for my seminar students and visitors to the doll shop, that dream has become a reality. We have transformed a former family property into a beautiful country garden retreat with two bedrooms, living room and dining room combination, complete kitchen, bathroom, and outdoor entertaining area. You can read about the history of Roberts’ Roost Country Guest House at: http://robertsroostcountryguesthouse.com/about/ . Many of you know that I am into “Nature Photography” and Roberts’ Roost provides the perfect back drop for many of my photos. Here are a few photos of some of the birds, blooms, and flowers of Roberts’ Roost. I currently have a promotion running where you can sign up to win a free two nights stay at Roberts’ Roost Country Guest House. Just go to the website http://robertsroostcountryguesthouse.com/ to register for the drawing. Drawing will take place on December 31st, 2014 and the winner can use their prize anytime in 2015 (availability permitting) . The next time you are planning a trip to visit Land of Oz Dolls or the surrounding area please consider a stay at Roberts’ Roost Country Guest House. I guarantee you will enjoy the peaceful serenity that Roberts’ Roost has to offer. Starting my Tour of the Doll Room at Land of Oz Dolls! Good morning all! 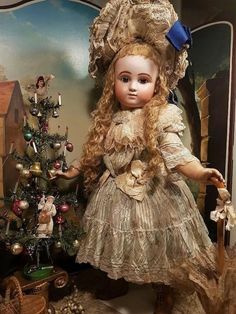 During my Open House last week, I had many requests from people for an online tour of the doll room for those too far away to attend in person. So today will start my virtual tour of the many displays within the doll display room. Most of the dolls are for sale, I only have a few dolls in there that are not. My 5 foot Lady Grace is not for sale as I will probably never get another one totally completed. 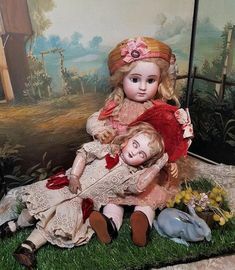 I also have a few antique German dolls mixed in for display purposes only that I have purchased reasonably at doll shows. If you see a doll you are interested in or have questions about just email me at landofozdolls@mchsi.com . Some dolls are no longer available and have been sold since I took these photos. Good morning all, the Wednesday, September 3rd, 2014 “Photos of the Day” are three of my 18″ “April” modern painted eye dolls. The original sculpture was created by Dianna Effner and the mold sold through Expression’s Dolls. Back in the winter of 2010 I taught an online eye painting class using these three dolls as my samples. “April” has intaglio eyes incised in the mold making her a little easier to learn the placement of the eyes. She is so much fun to paint and has such a sweet expression. All three dolls are wearing wigs from Monique Trading and the costumes were made by Sue Sharp of “The Sharp Needle”. I do have this doll available in soft-fired greenware, blank bisque and as a finished doll by order. She has her own all porcelain body (Portrait Body). I do have the CD Workbooks for Painted Eyes available on my website here. Have a great dolly Wednesday! Good morning all, my “Photo of the Day” for September 2nd, is one of my favorite modern dolls. 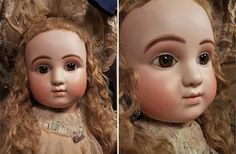 I mainly do antique reproductions but every once in awhile I will get to do a modern doll with painted eyes. “Little Lou” was originally sculpted by Diana Effner and the molds produced from Expressions Dolls. 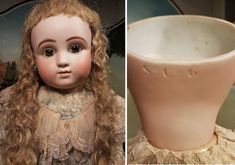 “Little Lou” stands 10″ tall on her own little all-porcelain body. She has very expressively painted blue eyes. She is wearing a costume that was made by Clara Pelfrey. 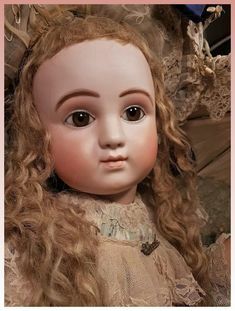 “Little Lou would be available in soft-fired greenware, blank bisque or also as a painted doll. This little beauty is no longer available for sale as she has been sold, however I do take orders for finished “Little Lou’s”. My CD Workbook on Modern Eye-Painting is also available here on the website. I hope you enjoyed this photo of “Little Lou”, until next time, have a great dolly day!